Dentist hands working on young teen patient with dental braces. 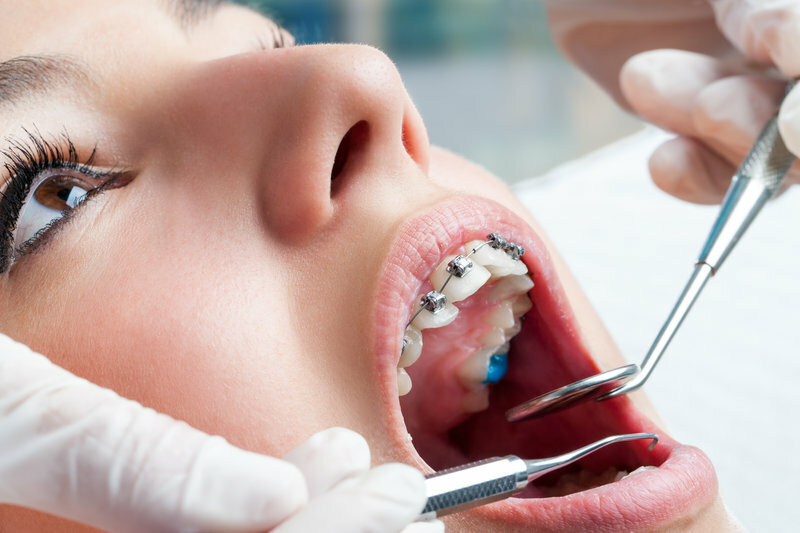 Should you receive dental care with braces or is seeing the orthodontist sufficient? Continue regular checkups with your dentist even if you are frequently seeing your orthodontist. Braces make you more prone to problems such as plaque buildup and tartar. Depending on the kind of braces you choose, your teeth may require additional steps to stay clean with braces than without. For some, the enamel can also weaken with braces. However, there are ways to keep your teeth healthy and clean while you have braces. Modern-day orthodontics offers treatment options everyone can be comfortable with and will still allow patients to receive proper dental care at the same time. We can answer frequently asked questions for receiving dental care with braces and help you with tips for taking care of your braces so your smile stays healthy. An orthodontist performs other services different than a dentist, although they are skilled in dental practices. Orthodontists receive 4 years of undergraduate education, where they then attend dental school for 4 years. After dental school, they attend a postdoctoral program to learn orthodontia. A dentist fixes problems with your teeth in general, while an orthodontist fixes problems with teeth alignment as well as your bite and jaw alignment. Basically, every orthodontist is a dentist, but not every dentist is an orthodontist. Patients benefit from having both a dentist and an orthodontist to maintain a healthy mouth. Taking care of your teeth is a bit different with braces than it was without them. During your orthodontic treatment, it is particularly important to maintain good oral health through proper oral hygiene. Brackets and wires in your mouth make it much easier for food particles to get stuck. When those food particles are not removed, it leads to other dental issues like tooth decay (cavities) and gum disease. Your teeth may also demineralize or erode in the areas where your brackets were attacked to the teeth. Areas on the enamel surface lose minerals in this case, which is what causes white squares to form on the teeth. If you drink beverages that stain the teeth easily, you might be left with uneven stains once the brackets have been removed. With braces, you should still follow the American Dental Association’s recommendation to brush the teeth at least twice a day. We recommend that you brush the teeth much more than that, as food particles can get stuck in the brackets at every single meal. Make sure to avoid hard foods like hard candies, chips, apples, nuts, popcorn and more with your brackets. Also avoid sticky foods such as gum, caramel, taffy, tootsie rolls, and gummies as these foods are much harder to get out of all the small areas of your braces. A lot of caring for your braces is watching what you eat and then cleaning the teeth often after you do eat. Flossing is one of the daily tasks that will be more difficult with braces because there is an archwire that blocks the floss from going in and out of the spaces between the teeth with ease. The solution for this is to use threadable floss or a floss threader. With a floss threader, you use regular floss and thread it through the eye of the threader much like you would with a sewing needle and thread. You then floss the threader between each tooth individually. Floss that comes threadable will be harder at one end and will be able to be threaded between the teeth without having to have a separate threader. After brushing with a toothbrush, you can also use a proxabrush, which looks like a small Christmas tree brush. You place this proxabrush between two brackets, below the archwire, and you brush up and down. This will get food that is hard-stuck in your brackets. Brushing after every meal will reduce how much food gets into your bracket and stays there. Even though you are seeing an orthodontist frequently, you must continue to visit your dentist throughout your care! An orthodontist will get your teeth straight, but you receive dental cleanings, comprehensive exams, and cavity care from a dentist, not an orthodontist. Both professions deal with the teeth, but they both deal differently with the teeth. Only a dentist can find cavities and fill them for you. A dentist can provide all the services we listed above, which are all very important to keep the teeth healthy. Receiving frequent dental exams and cleanings are some of the best dental services you can receive while wearing braces, because keeping the teeth clean and free of cavities will help your smile be that much more beautiful in the end. Your tooth enamel can suffer permanent damage if you don’t take extra care with your teeth with braces. That’s why it’s even more important to receive dental care while you have braces. Be vigilant with your oral hygiene every single day. Don’t skip days! You are spending months of your life to receive a straighter smile. You want that smile to also be a beautiful one at the end of your treatment. In the end, it is very important to receive dental care during braces and to take care of them yourself every day at home. If you have questions about caring for your braces, call our Belmar Orthodontics office today at (303) 225-9016.